GeReLeC offers a professional service in under carpet heating and insulation for your home or office. With our Under Carpet Heating System the heat rises gently throughout the room, delivering the heat directly to the living area with minimum heat loss. As Underfloor Heating Specialists we supply and install the full under carpet heating system for your home or office. Under Carpet Heating can be quickly installed under new or existing carpets. CARPET TYPE SUITABLE FOR UNDER CARPET HEATING: Under any modern polypropylene or hessian-backed and woven carpet. Even coir or sisal carpets, but not under rubber or foam-backed carpets. CONTROLS: While the heaters have been designed to never overheat - and may be left on continuously - timers and thermostats are available as optional extras for additional control. 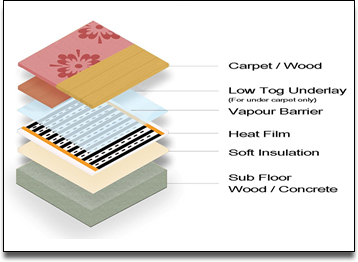 ECONOMICAL: Our undercarpet heating system is effective within 30 minutes of switch-on. You can heat the area that you need, when you need it. To give you an idea of the economy of our underfloor heating system, a UC250 (70 x 180cm) under carpet heater uses less power than three 100 watt light bulbs. 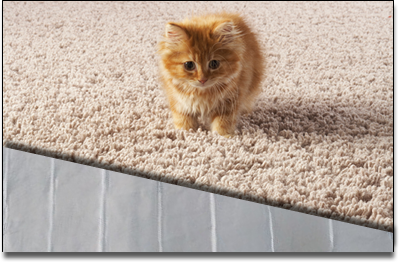 SAFE: Our undercarpet heaters are safety tested and are completely waterproof. It is encased in a tough "earth shield" which withstands heavy traffic and eliminates the risk of electric shock. UNOBSTRUSIVE: Discreetly hidden from view, this wafer-thin heater lies hidden between the carpet and underlay. There are no visible elements or radiators. No summertime storage problems. TECHNOLOGY: The components used within the installation have the benefit of over 30 years of European technology for applications that demand high flexibility, continuous operation at high temperatures and long working life. 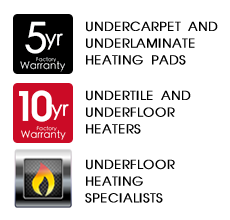 A 5 year factory-backed warranty is provided. Warranty forms are issued with each heater.